I used Helmar's Craft & Hobby PVA glue to draw a feather line design on mixed media paper. It took a bit to dry but once it did, I used the Pan Pastels to create blended colors with the foam tools. You can see that they glue creates a raised edge that resists the pastel. These Pan Pastels are rich and so much fun to use. They blend beautifully and the tools create smooth application onto any paper surface! Just look at these colors! WOW! I love the soft effect it gives and the bright reds, yellow and purple are gorgeous! I used a Donna Downey Prima stencil over cardstock for this background. Such a fun way to add color and pattern to a page! The paper layers were added with the 1/2" Zap Dots to pop them up and create depth. I added embellishments to the page with Helmar 450 Quick Dry Adhesive. The combination of Helmar glues and Pan Pastel is a perfect match! Pan Pastels in Permanent Red, Diarylide Yellow Shade, Ultramarine Blue Tint, Violet Shade, Titanium White, and Burnt Sienna Shade. "PanPastel are artist's pastel in a pan. Mix, blend, layer & apply like paint. Ultra soft. Low Dust. 80 Highly pigmented colors. For painting, drawing & mixed media art." "Helmar Acid Free glue has been specifically formulated for memory albums,book binding, mounting photographs, preserving old or precious books, documents, scrap books, most craft projects, etc. Excellent adhesion to dense papers, high flexibility, long term life of the bond. Sets clear, dries quickly and will not yellow with age." Applying Pan-Pastels with the Angle Slice Art Sponge to create a depth of color over the acrylic paint. Tissue paper, vintage book pages, washi tape applied with Helmar Professional Acid Free Glue and applied several colors of PanPastels over entire section. More stamped images applied with Helmar Professional Acid Free Glue. Stamped image directly over PanPastels. Sirens Blazing for Helmar and PanPastel! Hi Helmar Fans, It's Erin with you today on day 2 of our week long team up with Helmar and Pan Pastels. This week, I thought I'd share with you a canvas destined for a little truck lover's room. I know I'm going to be making more emergency vehicles before the decorating is complete. I started with a 12inch x 16inch canvas, pre-primed with Gesso. and added some base colours in acrylic paint. Once the paint was dry, I added strips of patterned paper using Helmar Decoupage and Craft Paste. Some stencilling with acrylic paint, before adding PanPastel Clouds with the No.3 oval knife and sponge Sofft applicator. I created the firetruck on a separate sheet of black textured cardstock, using the sponge applicator and PanPastels. Helmar Decoupage and Craft Paste was used to (carefully) apply it to the canvas. Once it was dry, I added additional highlights of PanPastel to create more play of light and dark on the firetruck. I love the way the colours come alive on dark paper! 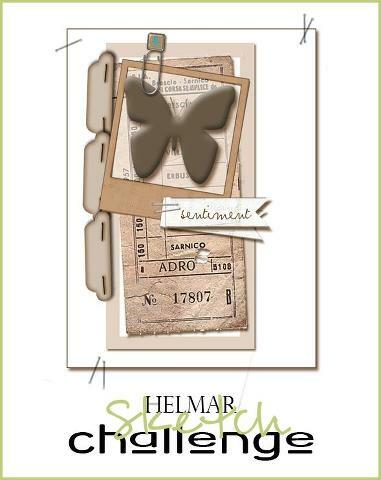 Hello Helmar Fans! JJ here today, to kickoff a week of projects featuring PanPastels. Although PanPastels are considered a 'fine art' material, they can also be a great addition to your scrapbook pages. You can use them like a paint - without the drying time, or warping! And I coloured all the chipboard pieces with PanPastels. They are highly pigmented - offering great coverage on dark chipboard, with no need to prime it first. I glued the chipboard shapes with 450 Quick Dry. One of the 'pencils' overlapped another, so I added Zap Dots at either end to even out the levels behind it. I glued all the papers and photo with Professional Acid Free glue. PanPastels have various sizes of applicators, allowing for broad or detailed strokes - I used the small Sofft Tool to apply the various colours for the crayons. Thanks for visiting - and don't forget to come back all week, to see other ideas using Helmar and PanPastels together! Hi, Vicky blogging today to share a few Winter projects and a flower tutorial that I made using my February Swirlydoos kit. First up is a layout using lots of premium craft glue for the paper layers, acid free to coat the chipboard in diamond dust (as well as adhere the Dusty Attic snowflakes and flourish to the page), 450 quick dry for the flowers and some adhesive runner for the photos. Good glue really does matter in getting a project properly completed! You will need 2 punched or die cut paper flowers with 5 or 6 wide petals (mine are 2.5 inch EK success daisy punches). Mist the flowers (with water or paint mist if preferred) and curl each petal. Pinch the petals while curled around the object. When almost dry, using a stylus, press the middle of each flower into a foam mat to raise the petals. Let completely dry. Use 450 quick dry to glue the centers of the dried layers together (off-setting the petals), pressing into the mat again with the stylus in the middle. Pinch the petal ends to shape a bit more. Now it is time to add a center of your choice. In my layout above, I simply glued a coordinating flower in the middle using 450 quick dry. Below (from a past project), I used gemtone glue to add loose pearls and used Clearsnap chalk ink for an antique look. Next up... an off the page project in celebration of LOVE month. A cinnamon heart filled jar (recycled Kraft brand jam jar). I used the Premium craft glue for the layers and Dusty Attic chipboard and then adhered everything to the jar using my favourite glue - the 450 quick dry. This stuff is so strong I even fixed my mop with it! 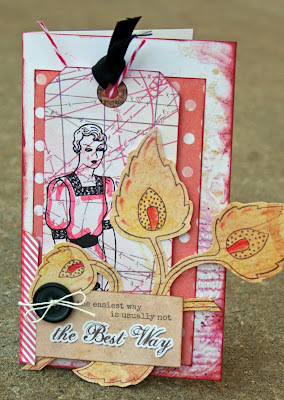 This project was inspired by the beautiful Feb. Helmar sketch challenge this month. Be sure to link your project in the Helmar blog sidebar for a chance to win some gluey goodness this month! Hello Everyone! I hope that you have had a wonderful week so far! Today I want to share with you a fun and colorful canvas that is full of lovely textures made by using different products from Helmar. With this canvas I started with acrylic paint as my base and then I painted a sunset and landscape with a little more acrylic paints. I had fun inking up the sides with Adirondack Achohol Ink from Tim Holtz, Ranger. To create a contrast in the sky and the sun I used Painty FX Ink from ZIG, Kuretake and I used a heat gun to get a nice bubbly effect on the surface of my sun! The heat does wonderful things with the layers of the paint, the Helmars Decoupage and Craft Paste , and the ink. At this point I put a coat of Helmars Decoupage and Craft Paste over the canvas. Now why do I do that? I do it because some mediums and colors act differently when I put a layer in between them and it gives me a nice effect as I build up my canvas. For instance...take a look at the yellows on the hill by the house. See how that color seems to be floating there. That is because of the Helmars Deoupage and Craft Paste that I had applied. At this point, I put on my scientist gloves...no really, I did put on latex gloves, and took out some Ice Resin and coated the stamped dictionary page that I had stamped with my Susan K. Weckesser Inc./ Unity Stamp Co. Stamps: 'Create your Day' little house and with the word Home. Why did I use Ice Resin the paper first? Well, because when you use Ice Resin on paper, especially older paper.... it changes the look of the page. In this case, the paper went translucent. After the Ice Resin dried, I used Helmars 450 Quick Dry Adhesive to adhere the house, word, and steps to the canvas. I then used Helmars two step Crackle Medium over the house and the rest of the canvas. To finish up the canvas, I used Tim Holtz Adirondack Achohol Ink from Ranger again. I put some onto a old cloth, and rubbed it into the cracks the the crackle had made to make an aged look. So many layers and so much fun! Take a little time today and experiment! You can't make mistakes...only art! Have a WONDERFUL & COLORFUL Day! Hi! Kate here. Today I am going to totally gush over my two favorite Helmar glues and I am going to share several of the projects I have made with my two favorite Helmar glues over the past month. How did I decide which ones were my favorite? They are the ones I use in almost every layout & card I make, they are the ones I chat about to other crafters(and anyone who might listen), they are the ones that get nervous that I will run out of them. A little crazy, I know! Which glues am I talking about? Helmar Premium Craft Glue and Helmar Zapdots. I'll be honest, when I first got my array of Helmar glues the Premium Craft Glue took a back seat to my Helmar Adhesive Runner and Helmar 450 Quick Dry Adhesive. When I was just about out of tape runner our DT Coordinator, Cheryl, recommended the Premium Craft Glue. I fell in love. The Premium Craft Glue is the perfect paper-on-paper glue. The dry time is fast, but not too fast. It dries clear. It doesn't warp my paper like other nameless liquid glues. It has become my go-to glue! Helmar ZapDots are the bomb! Have you used them? They come in all different kinds...1/4" white and black round and square, 1/2" white and black round and square, and even clear in 1/4" & 1/2" square. My favorite are the 1/4" white square, but honestly, they all get used here. ZapDots give height to my papers and embellishments. They are wonderfully sticky. They can be layered to give even more height. In "Wear? Eat?" I used Helmar Premium Craft Glue on almost all the paper and embellisments. Even the buttons! I used the Helmar ZapDots to give a bit of height (you'll hear me say that alot) to my embellishment cluster in the bottom right cornter. Again, using Helmar Premium Craft Glue for all my paper and alphas in "Insta-Smile." The Zapdots giving height to the embellishments. Even on my cards I use the Helmar Premium Craft Glue and Zapdots. You can see in my "Happy Happy Happy" card how much height the Zapdots gave to the banners. In "Snow Angels," I actually cut the 1/4" white square Zapdots in half to give the bottom banner height. I wasn't kidding about giving things height with Zapdots, was I? "Auntie" showcases only Helmar Premium Craft Glue. Lots of layering of paper and still so smooth! I have many more projects I could share from the last month that use only Helmar Premium Craft Glue and Helmar Zapdots, but I am sure you get the idea. Now, don't get me wrong, I do use all the Helmar glues that I own. None of them are unloved, not one. It is just that the Premium Craft Glue and Zapdots are my absolute Helmar favorites! Go on and get some of your own Helmar Premium Craft Glue & Helmar Zapdots today. You will be so happy you did! Hi everyone, Beck here again with a lovely card I created for my cousin's 50th Birthday. It needed to be large as there were a great number of signatures and messages to go in there, so I made it A4 size. When I saw these beautiful papers by 7 Dots, I knew they would be just perfect! All I needed to do was team it up with my Helmar adheasives to put it together. I did use some lovely Spellbinders Dies to create all the lovely layers. Here are some up and close pics as well. I achieved the lovely dimension on this card using Helmar Liquid Scrap Dots. I adhered all the paper on paper with Helmar Professional Acid Free glue. These Spellbinders flowers wouldn't have been put together so nicely if it wasn't for the help of Helmar 450 Quick Dry which makes the making process so much easier. This range of paper was just so easy to work with! I hope I have inspired you to go and get your hands on some 7 Dots papers and team them up with Helmar to create something special. Hello Helmar fans! I hope you all had a beautiful Valentine's Day yesterday. I am loving the Feb sketch challenge made by our lovely Lydell Quin. 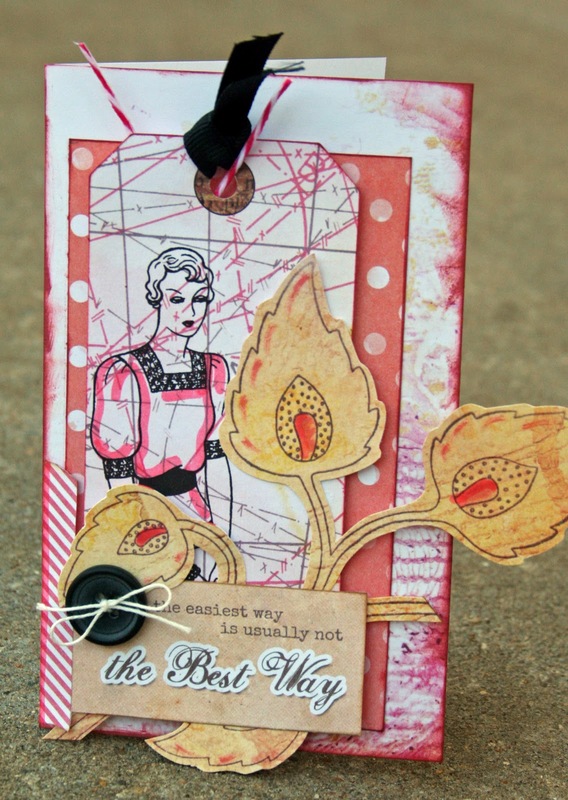 I created a card using this amazing sketch with Helmar supplies and 7 Dots Studio papers. Talk about a great combination! If you want to get in on the action and join in on this month's challenge, this is what you have to do: Using the new Linky tool in our sidebar, your projects will be seen and be accessable on the Helmar Blog..... all you have to do is load your project into its own blog post on your blog and add your project details- (before the end of the month), for your chance to win a fabulous Helmar goodie pack! )....then copy the URL for that post and come back here and click the INLINKZ Upload button (in the sidebar) and follow the prompts. A HUGE thank you to 7 Dots Studio for partnering with us this week! Today I am so excited to share with you what I have created with 7 Dots Studio Papers and Stickers and my favorite Helmar adhesives. The Domestic Goddess line really stood out to me... I knew I would be making more than just a Valentine or two as I started looking over the papers... I knew I would be making a Valentine to ME. Yes, me. and I will share more about that on my personal blog, but for now, I will share what I have created with the paper, stickers and glue..... and how wonderfully they worked together! I started with a basic design for both the pages and the tags. This helped my design move a little faster and then I could add embellish and decorate as I wished after the base was completed. I use this process for all mini albums I create and always have for the most part. It is the stuff on top that I really care about and not what is on the base for the most part. These two pages set the tone for the rest of the album, a solid base, a "pocket", a shipping tag with some embellishing and doilie with sequins. I used a lot of Premium Craft Glue on these pages. I am an avid paper stitcher and with liquid glue I can add just little dabs here and there to hold it into place, but not gum up my needed with adhesive. That makes it so much faster and easier to create my project. I also used Liquid Scrap Dots to add a lift to embellishments on my pages, like the "motherhood" circle sticker on the first page. Here is the tag up close. You may also note I used a lot of Epiphany Crafts tools and bubble caps. When I create banners like on the first page's tag, I just add a dab of Premium Craft Glue on one end and then let the rest "float" so that it can give the banner more movement and lift. Also, scrapdots are used to give the little circles a lift. The clear page was fun to create with and the Premium Craft Glue again was perfect since it dried nice and clear and did not show through at all! The Gemstone Glue was so perfect for helping me to stick down those littel sequins perfectly! Did you see that little clock hand? I have had that in my stash forever (I think since 1999) and was so happy to pull it out and find it macthed the papers perfectly! I feel so blessed to be able to play with my favorite glue and 7 Dots Studio products! They are so beautifully designed and I enjoyed thinking out of my box, getting my hands all messy and becoming a mixed media artist this week! To hear more of the story behind this album and see more details be sure to check out my blog soon. Happy Gluing and Messy Making!